Burn for Burn is the story of three girls- Lillia, Kat, & Mary- who want to get back at three people who burned them- Alex, Rennie, & Reeve. Just when you think you know what’s going to happen, everything goes completely awry, and it’s an engaging, dark, drama-filled ride you won’t soon forget. I don’t even know where to start with this review, and I mean that in a great way. Burn for Burn is engrossing and well-written from beginning to end, soup to nuts. The characters are entirely believable, their stories are compelling, and by the end, you’re not sure whose side you’re on anymore or if winning is even possible. It’s a testament to the talents of Jenny Han and Siobhan Vivian that two authors with two distinct styles can write three different points of view, and each of the POVs stands out on their own. It’s an incredibly fast read because it’s so hard to put down. You just have to know what happens next. This is serious drama, and I seriously loved it. The relationship between our three main characters is dynamic and very interesting. Kat and Lillia were friends in the past but grew apart years ago after an unfortunate falling out caused by Rennie (more about her later), and Mary works as a good unbiased voice in times when they need it. As far as the actions of the burners are concerned, these girls do some pretty terrible things, and there’s a part of you that doesn’t quite get why they want to take it to this extreme. And then you find out why. Then, no punishment becomes strong enough because, again, this is some seriously dark stuff. By the time the burns roll around in an entirely climatic and intense fashion, you’re rooting for the burnees to go down in proverbial flames. Speaking of burnees, I have never felt such anger toward a character in my life than the anger I feel toward Rennie Holtz, Lillia’s best friend and Kat’s burn victim. I was not a fan of hers from the first moment she appeared on the page, and it just got worse and worse with every turn. She is the absolute worst friend, ever. She makes Regina George look like Liz Lemon. It’s rare for me to get like this over anyone, but trust me. She may be a great character-- complicated, multifaceted, not remotely boring—but still I say, she is the worst. 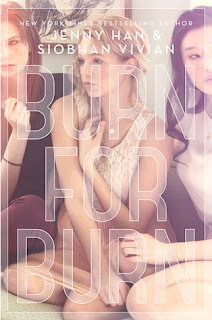 For now, I can only wait and recommend Burn for Burn to anyone who’s ever yearned to serve up a cold slice of revenge. "Mean girl" books can sometimes be too mean for my tastes, but this sounds like it has a really strong plot and characters to keep me interested. Thanks for the heads-up! This one is definitely worth a try. There are Mean Girls a-plenty, but there's much more to these characters.